The Supreme Court of Nebraska will decide whether homeschoolers Eric and Gail Thacker violated Nebraska law because their homeschool calendar didn’t start until October while the public schools began in August. Because this homeschooling case will now be decided by the state’s highest court it is of great concern to all homeschoolers, especially those in Nebraska. HSLDA did not choose this fight, but we covet your prayers for a good decision. This case began when the Thacker family moved to Nebraska in 2011. Committed homeschoolers, the Thackers carefully reviewed Nebraska’s compulsory attendance statute and homeschool rules. In Nebraska, homeschools operate as exempt private schools. The Thackers understood the law to say that first-time exempt homeschools—such as theirs—could be established at any time, as long as they provided 1,032 hours of elementary instruction to their children between July 1 and the following June 30. Because the Thackers’ living situation was uncertain (they were considering a job opportunity in another state that could cause them to move again), they decided to start their school in early November. Accordingly, they filed their notice with the Nebraska Department of Education (NDE) at the end of September. Along with their notice, they submitted a calendar that mapped out how they would provide more than 1,300 hours of instruction over the course of the 2011–2012 school year. Before the NDE could acknowledge receipt of the exempt-homeschool notice, the Thackers received a court summons. The charge? Their children had not attended the local public school from mid-August when classes began. Shortly after they received the summons, the NDE acknowledged that their exempt-homeschool notice had been received and that their exempt homeschool was in full compliance for the 2011–2012 school year. The county prosecutor nevertheless charged them with truancy in county court for every day the public school had been in session until the NDE’s acknowledgment in October. Home School Legal Defense Association litigation attorneys Darren Jones and Peter Kamakawiwoole represented the Thackers at trial. The state’s case had two glaring flaws: First, Nebraska’s compulsory attendance law only requires regular attendance at the public, private, or exempt school in which the child is actually enrolled. How could the Thackers be charged with absences from public school if they had never enrolled their children in public school? Second, Nebraska requires every kind of school—public, private, and exempt—to provide 1,032 hours of instruction sometime during the school year, but does not dictate the start date for any of the different kinds of schools. How can it be a crime to provide the required hours of instruction in the required time in an exempt school? The state’s answer was both novel and unsettling: in Nebraska, the prosecutor argued, children are presumed to be enrolled in public school, unless and until their parents take them out. The Thackers may have started their homeschool in October, but until they did so, the prosecutor’s argument went, their children were enrolled in the local public school by operation of law—even though not actually enrolled—and were legally obligated to attend the public school. The county court judge agreed with the state and found the Thackers guilty of violating compulsory attendance laws, a Class III misdemeanor. The judged sentenced them to a fine of $0.00 (yes, you read that right, zero dollars). The district court judge threw out the conviction, noting that the Nebraska law has no deadline for commencing an exempt school for the first time. He also said that the Thackers’ exempt homeschool had ample time to complete the 1,032 hours of instruction before the end of the school year—in accordance with the calendar they had provided to the NDE. The state refused to accept the district court’s opinion and appealed. In an unusual twist, the Supreme Court of Nebraska decided to skip the intermediate court of appeals and took the case itself. In this procedural posture, the Thackers’ convictions cannot be reinstated, but the Supreme Court has demonstrated that it wishes to settle the legal issues raised by the case itself—once and for all. You may read the state’s opening brief here, and our response brief here. This case demonstrates that we need to be ever-vigilant in defending homeschooling freedom. Please join us in praying for favor with the Supreme Court on behalf of the Thackers and homeschoolers in Nebraska. Our efforts to defend families like the Thackers would not be possible without the support of our members. 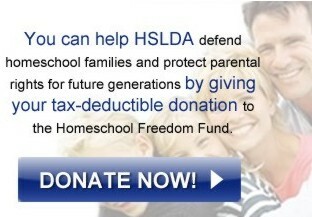 If you are not already a member, please consider joining HSLDA to stand with the Thacker family. Or please consider supporting our ongoing work in advancing the cause of freedom by making a tax-deductible donation to the Homeschool Freedom Fund.